At Lower Barn Farm, we put style and practicality at the centre of every kitchen design. Aside from an aesthetically pleasing kitchen, we understand the importance of having enough storage to best compliment your lifestyle. That’s why we have a range of ideas to share with you on how to make the most out of your kitchen storage. A bin is a necessity in any kitchen, but can consume space and look untidy. 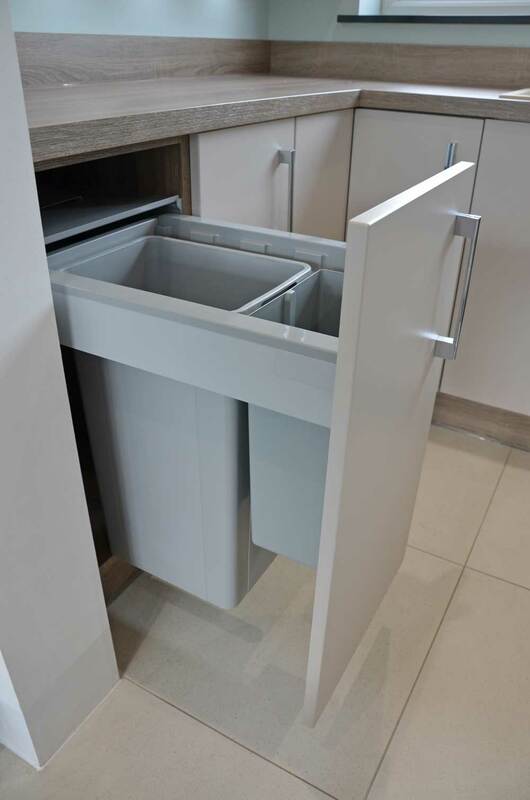 With integrated drawers, you can easily disguise your bin. This way, you keep your kitchen looking and feeling clean, knowing your bin is neatly tucked away. Why not take advantage of this useful idea and add an extra compartment for your cleaning products? No more cloths, sprays and wipes messily sitting under your sink! 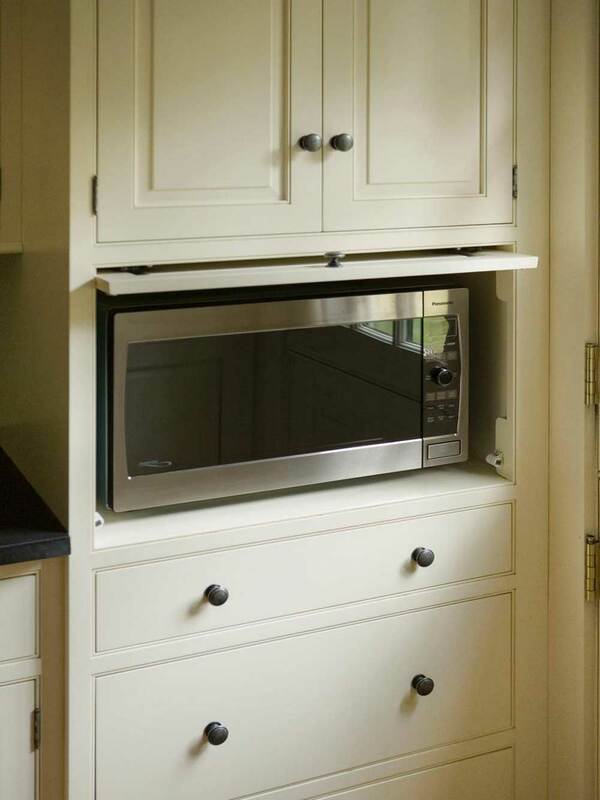 If a built-in microwave isn’t quite your style, but you want to free up worktop space from your appliances like your microwave, why not hide it behind a cabinet door. 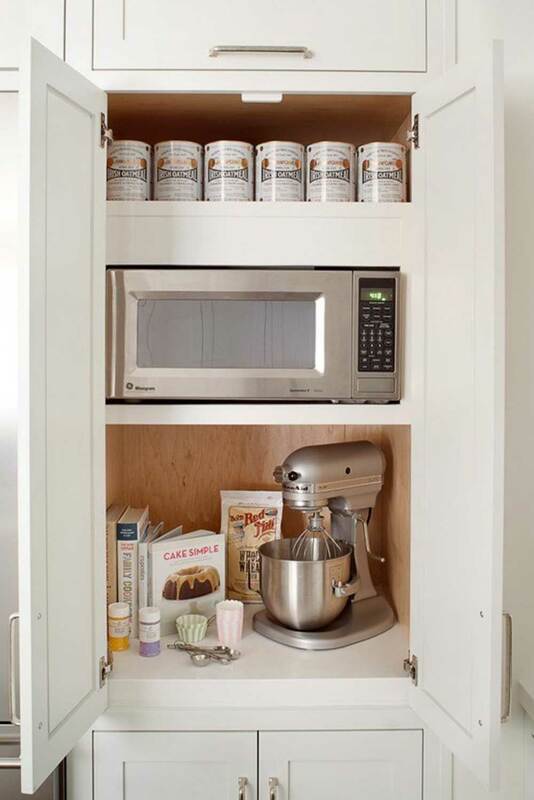 This allows you to save space and store other items here dependant on the size of the cabinet. Save money on a built-in microwave with a similar, if not smarter effect. Still on saving worktop space? Consider the new technology of a 3-in-1 hot, cold and boiling water tap. Provided at Lower Barn Farm, we sell and have a live-display of the Quooker boiling taps. No need to worry about where to put your kettle when it is built into your tap! Rather than buying cutlery dividers separate to your kitchen drawers, why not merge the two together and ask for built-in cutlery drawers when designing your kitchen. This will eliminate clutter and mess in your drawers, keeping your knives, forks, spoons and other utensils in designated areas. Be tech-savvy with hidden worktop plugs. Save on wall space with plugs designed to stay neatly tucked away when not in use. Don’t be afraid to ask for the plug top to replicate your worktop for a seamless blend. Intrigued by some of our suggestions? Come visit our showroom today or call 01268780991 and start gathering ideas for your new kitchen storage plan. You won’t be disappointed!